It all started when busy father Greg Pembroke posted a few pictures online of his three-year-old son, mid-tantrum, alongside the reason his son was crying: He had broken his bit of cheese in half. In Reasons My Kid is Crying, Greg collects together photos sent from parents around the world, documenting the many, completely logical reasons why small children cry. Among them: “I let him play on the grass” . . . “He ran out of toys to throw into his pool” . . . “The neighbor’s dog isn’t outside”. The result is both an affectionate portrait of the universal, baffling logic of toddlers—and a reminder for burned-out parents everywhere that they are not alone. My thoughts: Oh.My.Hotcakes. This book is flat-out funny and in some ways, sad. Included are pictures of kids crying which is heart wrenching, but the reasons they are crying... is just pull-your-pants-down funny. One of my personal favorites was "It wasn't raining inside." Awesome! 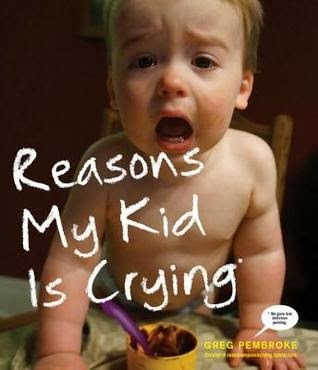 As a parent to a toddler (gulp), I can attest to the fact that kids will cry for the most insane reasons. One of Bug's favorite reasons to launch into a full-blown tantrum in .000001 seconds is when I firmly tell Preston "No!" when he is being aggressive toward her. Really? You don't want me to tell your brother not to eat you? Okay, fine, then. Be kitty chow. Alas, kids will be kids. Kudos to Greg for thinking of archiving his kid's craziest stunts so when his kid has kids, he has photographic evidence of what he is going to experience. And let me tell you: it's not pretty. But it is hilarious.